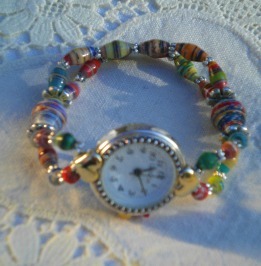 I have made quite a few watches and this one is my favorite. I ended up keeping it for myself because it fits me perfectly, love the colors and I got tons of compliments:) This is very easy to make, and I meant it! I wear this everyday! I know that when the battery runs out I can just replace it myself and if something happens to the band, it can easily be replaced with new beads. Very nice Janice. 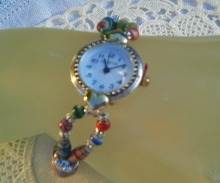 I really like this watch face with the colorful beads that you made with it. Great job! I think watch bands are a great project. If you can find a way to make them so you can easily take on and off you can wear a different one for occasions as they come up. wow! I love this watch, janice! I understand that you have kept for you and you put all the day…. the colors are fantastic and very cheerful! (I agree with Gisela!) 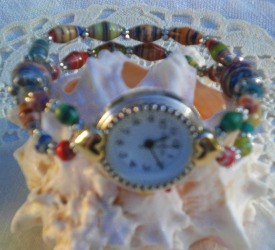 I have an old watch that I love but which has no band … so instead of buying another, i’ll replaced it with one in paper beads i’ll make too! another good way to recycle used objects…. I love this. It looks so happy cheerful and very attractive.